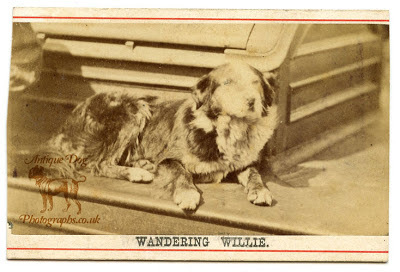 This photograph depicts the legendary Northumbrian Border Collie "Wandering Willie". Willie's story is somewhat sad - in 1873 he was separated from his master and Willie waited for him for months on end, then survived being thrown into the river Tyne. He was never reunited with his master but he was eventually taken in by a local ferryman called Ralph. After Willie's death in 1880 Ralph had Willie stuffed and mounted behind glass in the Turk's Head Pub in Tynemouth. To this day you can still visit the Turk's Head and see Willie for yourself. 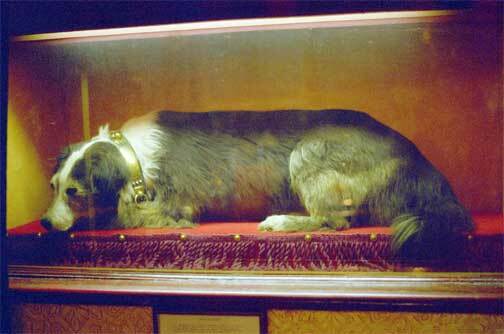 Many a touching story has been told of the faithfulness of the dog, yet there are few, in my opinion, so remarkable as that of “Wandering Willie,” the Northumbrian collie which sixteen years ago became celebrated on the Shields ferry by its devoted and persevering search for its master. It was in August, 1873, that a shepherd was on his way from the Cheviots to the Cleveland Hills with a beautiful drove of white lambs. Great was their excitement when they crossed the Tyne at Shields by the steam ferry. The mingling noise of the steam-engine and the paddle-wheels, the gurgling of the waters, and the whirl of traffic disturbed their mountain serenity ; and no sooner had their trotters touched the county palatine, and their nostrils sniffed the unwonted atmosphere of a manufacturing town, than off they scampered in astonishment and consternation. They were in a region of glass-houses and alkali works, and soon they saw signs of what seemed to them a thunderstorm. It was simply a cloud of dense black smoke, but it brought them to a sudden halt. It was a new world to them, and they were not at all at home in it. So they fled for escape, describing all manner of curves and angles in their alarm. Every thoroughfare had now its separate flock; not a street, or lane, or alley was unvisited by the bleating mountaineers, and distress and distraction accompanied their flight. The shepherd’s dog would fain have followed them all at one and the same time; but, if Boyle Roche’s head could be in two places at once, who ever heard of anybody being in six or seven? The dog pursued the lambs, however, in turns. Bounding and running, turning and driving, he got them at last into one flock, and, with a zeal and earnestness worthy of human imitation, brought them all to the presence of his master. At the first count one of their number was apparently missing, and the drover raised a cry in Willie’s ear which he well understood. Away he ran in chase of the missing lamb, but in his absence the drove was found to be complete. The autumn sun had now gone down, the toil-worn shepherd had four miles to go before resting his weary charge, and he moved onward. The dog, which was expected to follow, did not return from his search for hours. He had sought the town in every conceivable corner for the supposed missing one, and late at night was once more at the ferry in quest of his master. He was not there, nor was he anywhere to be found. Men came and went, but in none of these could the poor brute identify the friend who was lost. Willie lay down in the track of his companion of the morning, moaning over his loss, and almost dead with work and want. He lingered on the spot for days and weeks, even for months, refusing comfort, growling at consolation, and setting his teeth against the kindest efforts to win him from his despair. He could only be lured into a meal by placing it within his reach, and leaving him unlocked at until the friendly purpose was served. He seemed to have a notion that whatever interest was manifested in his welfare, whether it came in the form of generous sympathy or substantial food, was but meant as a bribe to induce him to forget his former master and enter the service of some new friend; and he would enlist under no leader in the place of him whom he had followed from the hills. For fully six months the writer visited him daily, yet nothing but a growl could be got from him in acknowledgment of any proffered attention. His independent spirit scorned all patronage. Offerings were constantly laid in his way; but he preferred to seek out on the shore rejected scraps of sustenance, and so provide for his own maintenance. 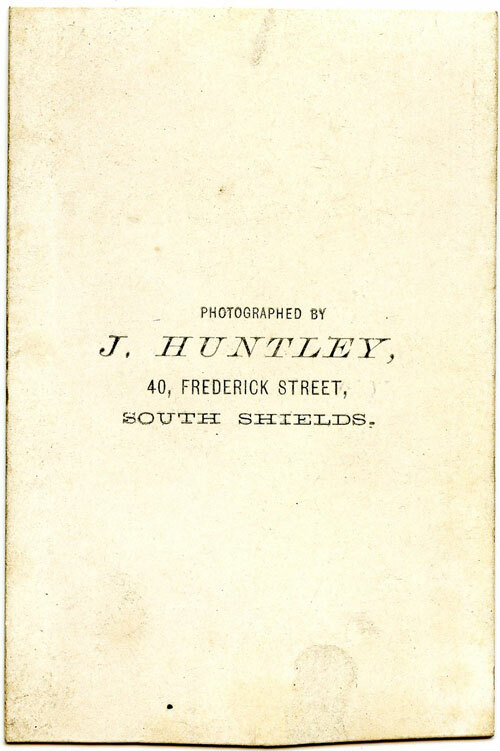 About this time the miserable waif, pining away out of life and an object of generous pity, was one night, with the best and roost humane intentions, thrown overboard from the steam ferry when the tide was running strongly seawards. But Willie had endured much, and yet lived. He had a canine tenacity of life, and he clung to it still. Notwithstanding his protracted sufferings, he strove against death, and in some unknown way escaped from the waves that threatened him with destruction. He was seen a week afterwards resuming his search. Hour by hour, night and day, he was found crossing the river by the ferry, making over and over again the passage which he had first undertaken on his arrival from the Cheviots. He always warily watched to see if the arm was on board that had dropped him into the stream, and if so, having no wish to be thus relieved of his cares, waited for the next boat. His master, returning in the following autumn, heard of his long lonely wanderings, but missed him by a few minutes, and could not recover him on that journey. Frequently was Willie taken home by friendly butchers, farmers, seamen, and others, and detained with hospitable thoughts, for he had awakened the widest sympathy by his devotion; but in a week or two he would break away from their care to renew his solitary life. When the close of 1874 drew on, there were general doubts whether he would survive the winter. His wearing anxiety had told upon his frame, and reduced him to a mere “ruckle of bones.” Time, however, that works wonders with us all, brought alleviation at last even to Willie. With a new black coat, and the ring round his neck restored in whiteness, he began to respond to the paternal kindness which all the ferrymen, and everyone who knew his story, bestowed upon him. He was even seen at last to wag his tail ! Food was accepted more readily, and with expressions of gratitude. His strength was regained, and he had a happier countenance. Not in the least, however, did he lighten his labours. He pursued them with added energy and zeal. His daily and nightly wanderings in search of his long-lost master went forward as earnestly as ever. Shortly after Willie’s woes were publicly known, he became such an object of interest to rich and poor alike that all kinds of food were brought to him. In fact, he grew vulgarly fat, and began to growl at every dog that crossed the ferry. On reaching land he claimed the right of being “first man” out, and would bark furiously as a proclamation that he had brought all the passengers safely over the water. This he did for several years. At last the street arabs, “turning to mirth all things on earth, as only boyhood can,” joined chorus with Willie, and created such a nuisance that the poor brute and his ragamuffin comrades had to be banished from the locality of the landing places. 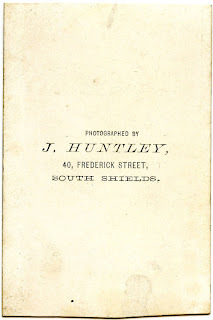 The dog, with Ralph, the ferryman, his keeper, was afterwards but occasionally seen in the streets of Shields. He once more grew disconsolate. Blindness and infirmities quickly gathered upon him, and at last, in 1880, old age finished his career. Ralph the ferryman had him stuffed and placed under a glass case. and many thousands attracted to Tynesdide exhibitions have gazed on this memorial of animal fidelity.